Friends of Coburg Olympic Pool has been advised by Moreland City Council that our outdoor pool may not be ready to open today, Sunday December 1 on what is traditionally the first day of the season. As it looks like being a beautiful day, perfect for outdoor pool swimming we are feeling very disappointed by this news. It is probably best to call the pool on tel:9354202096 before heading down. Please Help us Recover our Stolen Bicycle Trailer! If you see it abandoned, or someone is trying to sell you one set up as a pram and without the bicycle hitch (we still have that), would you PLEASE contact Anthony on 0418390081 or Brunswick police (a report has been filed). It is only a year old and has no distinguishing features except that the front wheel has some damage, and that there is a bike lamp bracket attached to the handle. Please also remember that there will be a Xmas dress up competition and a doggy dance competition!!! Come along with you favourite furry friend. It's hard to believe that this is our last market for 2013. We have a great market lined up for you with over 30 stalls of local handmade wares. We're sure you'll find something for everyone on your list. FREE Children's Craft Table, delicious food and drinks and live music ! We look forward to seeing you at 99 Leinster Grove, Thornbury from 10am - 2pm for a fantastic day. I have a swimsuit and Hat bizz going on by the name of 'Swim-suits and BBQ Wear'. 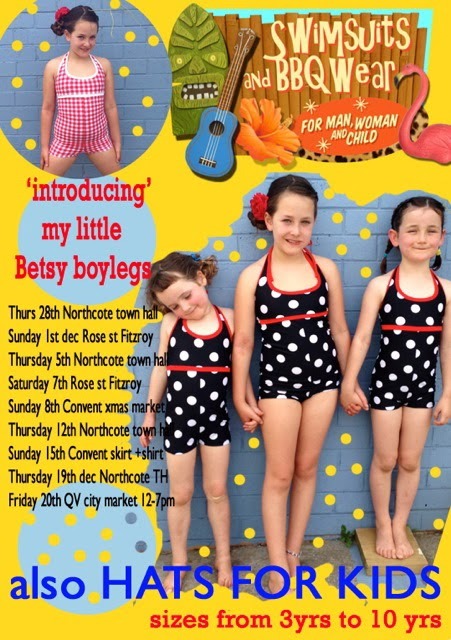 I'm doing my market blitz before the silly season so if any one needs a new suitable swim-suit then here is a list of my markets . If for any reason you can't get out of the hood then you'd be welcome to pop up to my humble studio for a try on session . This year I'm introducing my kids (3yrs-12yrs ) swimmers and hats, which I'm very excited about and so is my 8 yr old daughter. My Hats are all reversible, washable and best of all sensible (or not ). Swimsuits are all one piece halter neck with differing leg lengths and no I don't do padding in the bra bit. So while the weather heats up and the Coburg pool gets cleaned for the opening this Sunday here's a squizz for your enjoyment . Hope to see you at the pool. Actually, she doesn't really eat as much as you might think, either, and she spends a lot of time lying around looking elegant/silly. She is de-sexed, micro chipped and vaccinated, and costs $380 through Second Chance Animal Rescue, but you can contact me if you'd like to meet her. Maybe she's not for you, but she could be for someone you know, she's a pretty special find, and I hope to see her and someone else happy together! Hi, I'm John Fleming, a Newlands resident and musician. My new all-ages dance band All Day Fritz plays music that both kids and adults love dancing to. We are performing this Sunday at a benefit for the Thin Green line Foundation. I am also an ambassador for the Thin Green Line which raises funds to support rangers on the front line of conservation. Come on down to the Retreat Hotel, Sydney Rd., Brunswick at 2pm this Sunday Dec 1st and have some fun while contributing to this very worthy cause. There's lots of other music on as well including Nick Barker and Dave Graney! See you soon, John. Here is the State Government spiel which reads that it has "appointed an assessment committee under Sections 35 and 235 of the Major Transport Projects Facilitation Act 2009 to assess the Comprehensive Impact Statement for the East West Link (Eastern Section) Project and to make recommendations to the Minister for Planning whether or not to grant any applicable approval required for the project to be developed and if so to recommend appropriate conditions for applicable approvals." Public submissions are being called for on the Comprehensive Impact Statement and have to be in keeping with the Government's "scoping directions". The closing date is C.O.B 12 December 2013. While many regard the "consultation" process over the East West Link as a sham, we consider that it is imperative that Victorians deluge the State Government with objections to the East West Link in the form of submissions to this enquiry. In 2008 over 2,600 people make submissions to the Eddington Review on the then Government's proposal for Mark I of the East West Link. (Many submissions were on proforma.) As you may know the East West Link was "deleted" from the Brumby Government's 2008 Transport Plan.We were told that "people power" was a factor in the decision. More bad news re the East West Link. We have confirmation that a 700 metre section across Royal Park will be open cut (and cover later - if ever); that the excavated spoil will be trucked out of Royal Park to fill up quarry sites in Keilor; and that CityLink will be widened on the west side taking out parklands, gardens, sports fields and a playground in the municipality of Moonee Valley. We urge you not only to make a submission but if you belong to a group, please send on this request to your members. Protectors of Public Lands Victoria Inc.
You are invited to this important meeting to help spread the campaign against the East West Link into more suburbs and build support for a serious investment in new public transport. A short reminder that meditation is still happening at 7.30am on Friday mornings – mostly at the senior citizens centre - we are also running some outside sessions! The year is winding up to a close and maybe you are starting to think about the new year and what changes you would like to make to your life or resolutions for the new year – maybe one of them is to come along to meditation classes? – Why not start before the end of the year at get the habit going while the weather is warmer! This Friday morning meet at the pedestrian bridge at the bend in Connolly Avenue at 7.30 am, we are going to do some outdoor meditation, including some mindfulness walking. Please let me know if you can make it along so I know who to wait for as we will move off the bridge. My no. is 0431 290 174 (and email is Rachael@s-e-l-f.com.au) if you need to get in touch, can’t find us or have any questions. I look forward to seeing you on Friday morning. 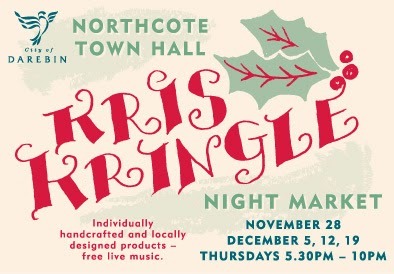 Northcote Town Hall Kris Kringle Markets start this Thursday! 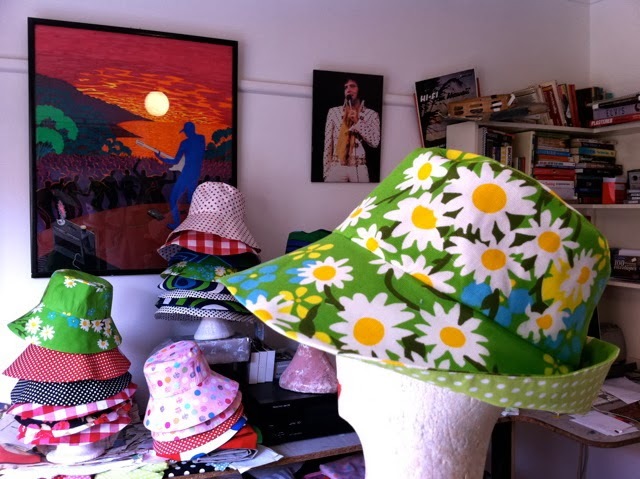 The Northcote Town Hall Kris Kringle Markets are on again with over 50 stall holders selling locally hand crafted items such as designer fashion, accessories, giftware, jewellery, ceramics, woodcrafts, homewares, kids’ items, and much, much more. Bring the family and enjoy free live music each week while you shop, and take some time out at Avenue des Italians and enjoy a unique blend of freshly ground coffee, freshly baked local produce and seasonal fruit. See (very) local makers Swim-Suits + BBQ Wear , Eanid and Starashan! It’s 74 days since the election, but we’re yet to hear anything of substance from the Abbott Government on school education. Still less any word on Gonski. It’s our job to start to rebuild the campaign momentum and ensure Education Minister Pyne pays attention to his education portfolio, not just cheap shot parliamentary theatrics. 1. Send a quick email to your local MP. No matter what party they are in, they need to know Gonski is an issue in their electorate. Click here to send your message. 2. Write to the Prime Minister. Send him a message today by clicking here. 3. Like the I give a Gonski campaign on Facebook, and share our posts with your friends. The Abbott Government has committed to honour just one third of the funding for the six year Gonski agreement the Victorian Government signed with the Commonwealth earlier this year. This is not nearly good enough. Schools need the funding certainty to plan for the long term, with the resources they need to give every student support to thrive. As always, a conversation in your lunch room at work, or around the kitchen table at home is one of the most powerful things you can do. Talk about Gonski. Talk about why it matters. And ask your friends, colleagues and family to register their support for Gonski. Together, we can secure the extra funding for schools to make sure every student in every school has the resources they need to achieve their best. 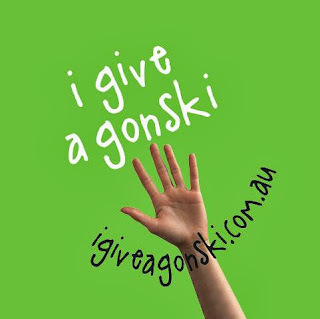 The I give a Gonski team. Coburg Harriers monthly fun run is here again. Happening this Sunday 24th November 2013, 9am start. We offer a 5km run or walk and a 10km run starting at Harold Stevens Athletic Field, Outlook Drive, Coburg (athletic field located behind the basketball stadium) and taking in the surrounding parklands. Online entries are open until Saturday night for our annual Coburg Lake Classic fun run event. Check out the link below to enter or rock up on the day from 8am to register. and I know your family will love it! 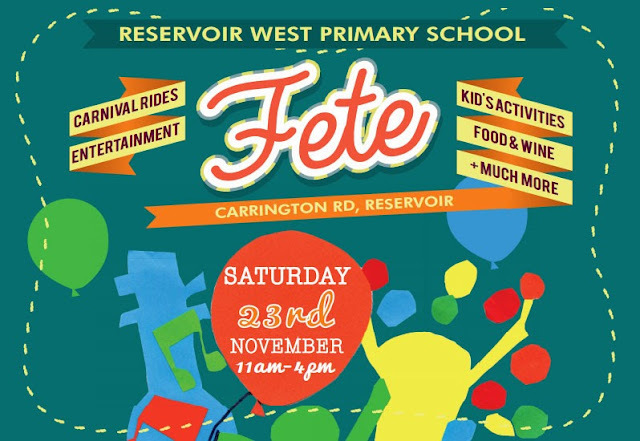 Checkout the website which is http://myschoolfete.com.au for all the details. It's an all-weather event, with heaps of under cover areas, rain, hail or shine. We have a squad of volunteers currently available to harvest back yard fruit trees in Darebin and we would love your support to get the word out about the project. We are currently looking for householders to register their trees so that we can pick them and give the fruit to agencies providing food for food insecure people. To date we have picked almost a tonne of fruit, but we know there is a lot more out there! If you know anyone in Darebin with excess fruit please pass this leaflet on. If you could help us by circulating the attached flier we would be most grateful. Also we are seeking a few more volunteers to join the Fruit Squad mainly to work on harvesting fruit, we don’t have a formal training course available this time round but monthly in-house training sessions will be made available. For more information contact liz at Jika Jika Community Centre tel: 9482 5100 or e-mail liz@jikajika.org.au. 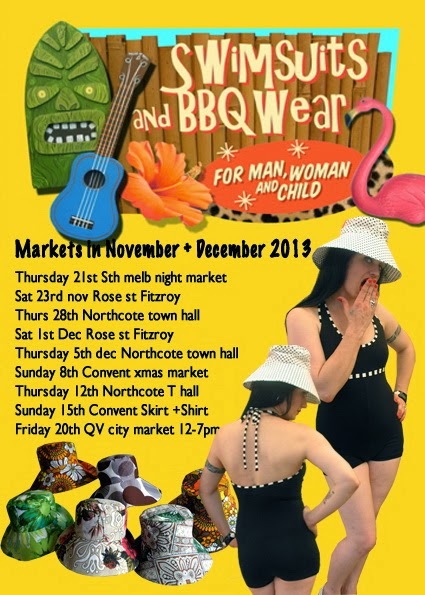 As well as the excitement of new seasons stone fruit, there will be a KIDS CLOTHES SWAP at the market. Bring along some clothes they no longer need and hopefully find some they do. For more reasons to visit the market check out Suburban Tomato's Top 5 Reasons to go to Coburg Farmer's Market. The Coburg Farmers Market is held every 2nd and 4th Saturday from 8am-1pm in the grounds of the North Coburg Primary School. The market stalls merge around a big central playground which is great for kids and there is an undercover area as well as shaded outdoor seating. Coburg Farmers Market is plastic bag free so please bring your own bags. The last market for the season is coming up on Thursday December December 5 from 3-7. This market is nestled within the beautiful community gardens alongside the train line near Thornbury station. Plenty of great seedlings for your garden, fresh produce for your kitchen, music for your ears, awesome designs and crafts (our very own Mim will be there) and tasty food for your belly. Here is a great web site that is selling stuff made by Social Enterprises, great Christmas ideas! The Good Gift Shop returns this Christmas to encourage Australians to do good by giving gifts from social enterprises—businesses that exist to tackle society’s wicked problems. With a (thoughtful) collection of good gifts that you can buy online in one easy transaction, the Good Gift Shop takes out the guilt and puts the fun back into Christmas shopping. Go on, shop your social heart out. I'm having a party on my front lawn on the 24th of this month. All welcome, there'll be a BBQ, live band (Hopefully) and heaps of music and fun. If you'd like to bring some drinks that is also more than cool. HOW? Whatever it's not an RSL...No courtesy bus. I'd Love to see you there. Any questions please email Girkinboy@gmail.com. Girls 'Merrell 'shoes (cerise) - size 1, and trainers (size 1 ) Call 0449798975. Going overseas at short notice so need to rent out home. Three bedroom brick home (2 double rooms and 1 kids room with 2 single beds)for let while overseas. View to the CBD from balcony, quiet street going down to Edgars Creek and great community-minded neighbours. If you know of anyone who maybe interested or even to rent as accommodation for relatives in town over Xmas and NY period, please make contact on 0449798975. Available from Nov 30 through Feb14th or for shorter periods.. I hope you have enjoyed the recent rain as much as I have! a good follow up rain in December and we can almost lock in the survival of the plantings done in 2013 (not to mention the pump may get a run in summer too). Well planting is over and there is still work to be done (as always). This Sunday we will be at the Silurian Cliff area doing maintenance on our plantings through this area (2009-2013). As usual Rob and I will be on site earlier from around 11.00 AM and all are welcome to come along earlier and assist with the planned tasks. Forecast for the day is a partly cloudy 23. Sure beats the 30 day for the last planting and mulching activity in October! Friendly environment and all levels welcome. Is anyone up for a childcare swap starting next year? I would like to work Tuesdays, and had to give up my spot at the child care centre due to everyone needing a Tuesday there! So, I am available to look after your child (negotiable for more than one!) on a Monday or a Wednesday in exchange for you looking after my child on a Tuesday. My child will be 3 in February, he is easy going and loves playing with other children. I also have an older child who goes to school. We live close to the corner of Murray Rd and Elizabeth St. If this could work for you, can you please contact me on 0431 609 586. Hidden Creek Neighbourhood House has a project to gather and share local stories of the Newlands Estate area (Coburg North). We are looking for more 'story gatherers'. If you think you might like to interview people ring Jennifer Borrell on 9350 3437 to have a chat. You can drop the food off at West Preston Baptist Church. We will be making a delivery on 24th of November. Hello. From 36 Ballard Ave Coburg North! Some sunflowers which must go in the ground soon. wooden boxes, TAA vinyl shoulder bag(60's) old leather suitcase and school ports, wooden parquetry serving tray, old red cedar box, unique wooden/ metal cloths horse. Klemm Bell surfboard( 60's) perfect condition with mactavish carry bag. Mac Donald's toys. More wooden indoor furniture and garden art furniture in the pipeline time allowing. Do you need a pet sitter who is 100% reliable when you go away this summer? 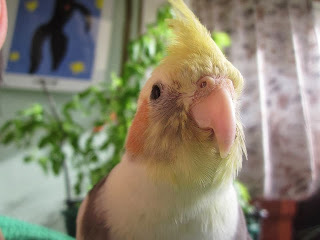 I am available for all kinds of pet sitting and dog walking, and I have professional experience in bird sitting and parrot care especially. I can work over Christmas and New Year, for negotiable and affordable rates, contact Shannon on 0416 801653. A lovely isa brown has made itself very comfortable in a backyard in Jackson Parade over the last few days. It is so comfortable in fact that it laid an egg in the front yard! If you are missing a chicken please contact Denise on 0451 067 489. My sister-in-law is moving out of the house we own in west Preston next weekend, and friends are moving in. As the sis-in-law is very pressed for time, and we are interstate, we have agreed to find someone to give the house a good clean in between tenants. I'm looking for someone willing to do 2-3 hours of cleaning in the empty house next Saturday afternoon (16 Nov). We can pay $25 an hour. The house should have already had a basic clean (vacuuming, bathroom etc) and the windows have been cleaned, so tasks will be things like wiping out kitchen cupboards, dusting surfaces, washing the slightly greasy wall behind the stove, making sure toilet and bathroom are clean etc. The cleaner will need to bring their own gear. If you are able to help us out, or know someone who can, it would be hugely appreciated! Please email me at annamcumming@gmail.com. Attend Moreland’s first public meeting to discuss our options before it’s too late. Estonian House, 43 Melville Road, Brunswick West. Moreland Councillors will be voting on Coburg Planning Amendment C123 at their next Council meeting on Wednesday 13 November. Venue: Glenroy Senior Citizens Centre, 11 Cromwell Street, Glenroy. Hello, my name is Jennifer Borrell. I am the worker for the Newlands Stories Project, which is based at Hidden Creek Neighbourhood House. With the community, we are gathering people’s stories of their life in and around Newlands. Importantly, we are organizing ways for people to share these stories, so we can learn more about each other and the local area. 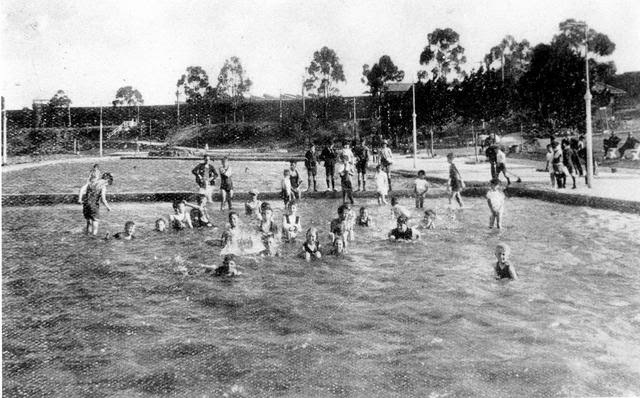 The Newlands Stories Project is funded by the Australian Government’s Community Heritage Project. The steering group includes representation from Council, Coburg Historical Society and Borderlands Cooperative. We are very excited about the Project and we have had a great deal of interest from the community and other organisations. So many stories are ‘coming out of the woodwork’ and we can’t wait to get them all down. We have an enthusiastic team of community volunteers to write these up, starting from this week. Some activities of the project are set in concrete (as part of the funding agreement) while we may follow up other ideas as we go. Definitely, we will set up a story-sharing website next year. We will also facilitate a mural about the interweaving stories of life in (and around) Newlands. Other ideas include: story workshops, quilt making, song writing, food sharing gatherings, a people’s heritage walk, radio stories, public readings and ‘campfire’ tales. Although it is ‘early days’, we have organised a solid foundation for the project and we have started ‘interviews’ to gather stories. To write a history of the local area, I have also been collecting and reading local histories and I have visited the museum of the Coburg Historical Society, where I was shown around by the president. This is situated in a bluestone building on Bell Street near the Council offices. A lot of effort has been put into publicising the project and liaising with key people and organisations, including local politicians and the media. An information session was conducted at the Neighbourhood House in early October, which was largely a ‘discussion session’ wherein a range of thoughtful ideas and reflections were shared. A ‘training session’ was also organised for community volunteer ‘interviewers’, including two students based at Borderlands Cooperative. If you would like to share or write your story, interview people, film or photograph (or share old photos), tell us your ideas or become involved in some other way, please ring Jennifer on 9350 3437. This is very much a community grassroots project and we welcome your interest and involvement. It's easy to get your news on Newlands Community News. It's good to include your contact details if you are selling, giving away or wanting something. Copyright © Newlands Community News 2012. Picture Window theme. Powered by Blogger.